Now back to this dish. An original Bell’Alimento, this dessert (recipe here) should be knighted. It has a slightly crisp yet fragile and crumby exterior which gives way to the slightest pressure with a spoon to release the molten flowing Nutella lava. It languidly flows all over the plate, soaking into its protective shell of a cake, softening it so it becomes like cake crumbs swimming through chocolate fudge. The Nutella really shines in this particular recipe ensemble and the best part is, it knows it. It knows the way your eyes greedily following its trail of gooey hot liquid when the cake splits open for the first time. It knows you are about to snap your spoon in two while it settles itself in a comfortable position around and on the delicate chocolate cake, taking all the time in the world because it can. Oh, the Nutella is a sly one, and don’t you forget it. Once grasped you are forever in its chocolate-hazelnut clutches, spiralling headfirst into the most decadent love affair ever which lasts a lifetime. You can never be free of it once caught. And this dessert shows exactly why. This is one of those desserts where I have to say – it doesn’t wait for you. You wait for it. I shall leave you now to go and spoon in your Nutella (do not even try the ‘but it isn’t open’ trick on yourself, you know you will succumb) and as soon as possible, just make this lava cake. For your own benefit sanity. lol where’s the recipe for this im so lost! and it looks amazing!!!! This possibly looks like the most delicious thing I have ever seen…..in my life. 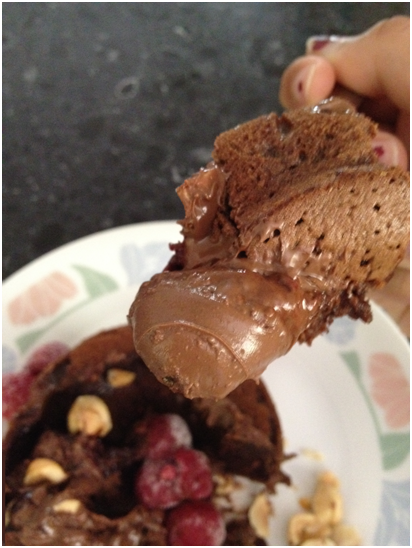 I love molten lava cakes, especially when there is Nutella involved! I have a horrible habit of eating Nutella straight from the jar, its so good! These molten cakes look delicious! Can’t wait to try them out! A piece of heaven on a plate! Looks fantastic. Thank you for your kind words and I hope your daughter enjoys! You are cruel, Guru. You know what email I will check. I should make and surprise my daughter some day or I should try gluten free version. I am sure your daughter would love this surprise and a healthier GF version sounds fantastic – let me know! Oh, my goodness…these are just the most amazing looking lava cakes ever!!! 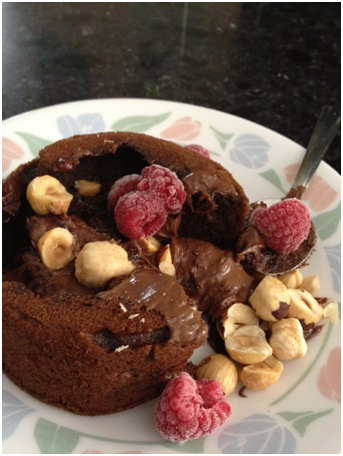 Thanks for sharing….I think I need a chocolate fix ASAP! 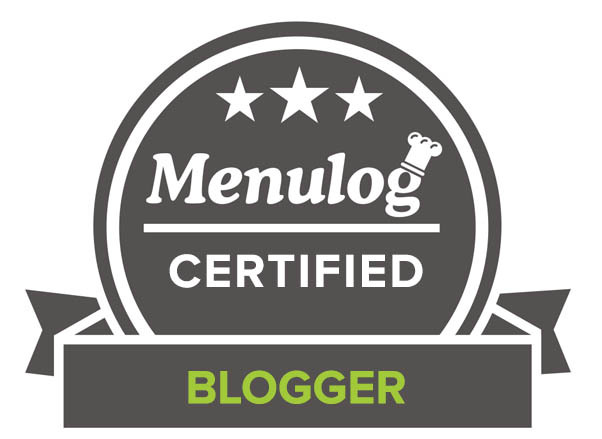 I am glad you enjoyed them – and I need a permanent chocolate fix! You are not making it any easier for me to fit back into my skinny jeans – these look so amazingly wonderful! Holy Nutella batman! That looks so amazing!!! I am thinking really Nutella should have it’s own month. That almost looks too good to be true. So glad it’s real! I am new to nutella, and I absolutely LOVE IT!! Eat it everyday for Breakfast…anyways this looks SOO Delicious! This is really a great one. 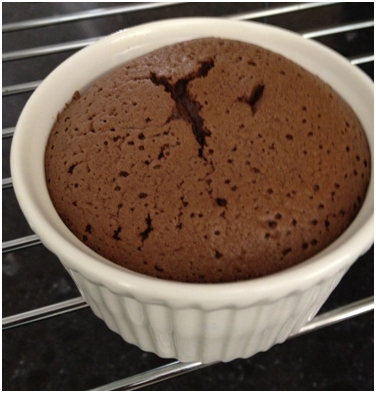 Regular lava cake is such a favorite among many, but with the nutella-that brings it to new heights. Lock the door, the chocoholics are about to raid your place! And I am in complete agreement with you – barricades up, shields a-go! 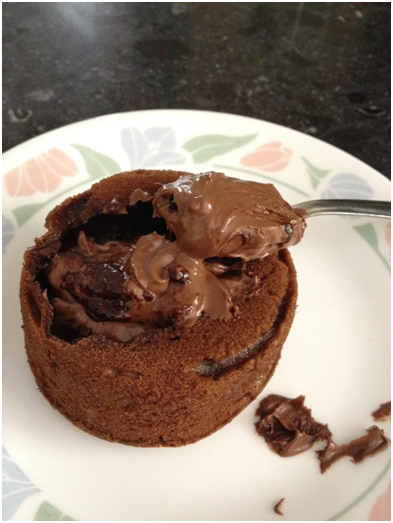 I love nutella and a molten cake is awesome the two together sound amazing!!! Seriously I would totally have to be your BFF just so I could have this cake!